The Canon Rebel T5i is often marketed as an entry-level travel camera, but it has so much more potential than that. For all of the various jobs it can do for you, here are the six best lenses we’ve researched for the Canon Rebel T5i. The T5i can accept both EF full-frame lenses and EF-S APS-C lenses. This capability really expands your options, and you’ll find both on this list. One thing that you’ll notice on this list is the prevalence of STM autofocus lenses. STM utilizes a stepping motor, different than Canon’s other USM, or ultrasonic motors. The advantages of this system is fast and accurate focus without any noise pollution finding its way into your video recording. The Rebel T5i does not have weather sealing, and neither do any of these lenses. This really helps bring the cost down while maintaining features like image stabilization. The T5i also contains in-camera lens correction profiles, allowing you to get the most out of these lenses. Canon’s update to their 18-55mm kit lens has a lot of exciting improvements. The new STM autofocus motor is extremely fast, accurate, and completely silent. This is perfect for those who also like to shoot video. Minimum focus distance is 10”. The image stabilization system also received an update, providing up to four stops of stabilization. This lens isn’t very rugged, so keep that in mind if you plan on taking it on outdoor adventures. There’s no weather sealing (just like the camera) and construction is entirely of plastic. The Rebel T5i comes with a few options for kit lenses. If you’re looking for a great, small, light lens to keep on your camera for most situations, the 18-55mm f/3.5-5.6 IS STM is the one to get. Just make sure you don’t get the older one, the IS II. This is a wonderful lens that works great for both photo and video. It’s one of the best kit lenses found on Canon cameras, and is offered with the Rebel T5i. It’s also a great alternative for the most expensive L-series lenses, if you want a great lens but are on a budget. There is some mild distortion at the wide zoom limit, but this can be fixed with lens profiles in post production. The same goes for some minor chromatic aberrations you’ll find. The zoom is very smooth and easy to fine-tune. In addition, the STM focus motor is incredibly silent for video use. Despite being a cheaper kit lens, this one features Canon’s special lens elements & coatings that minimize chromatic aberrations and flaring while increasing image clarity. This lens also features a redesigned image stabilization system that offers up to four stops of stabilization for handheld shooting. The focus system works very well in this lens. The autofocus is very smooth during video recording, and silent. You may override autofocus by turning the focus ring. The lens will also hold its focus while you zoom. With all of the great things incorporated into this lens, it’s difficult to believe that it weighs less than a half-pound. The construction may not give someone a lot of confidence. It’s entirely plastic (except for the glass), including the mount. Plastic mounts rarely fail, but they’re certainly not as robust as metal. At least the lens is light and this keeps a lot of stress off of the mount. Even with all of the special lens elements, there is a noticeable amount of chromatic aberrations. Most of this can be fixed with lens profiles in post-processing. The variable aperture really slows down at the telephoto end. 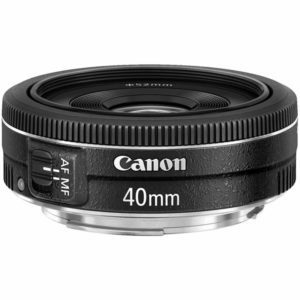 Canon would have that much better of a product if the maximum aperture at 55mm was f/4.0. 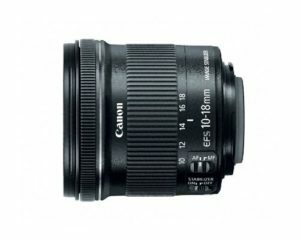 The EF-S 18-135mm f/3.5-5.6 IS STM is a great update to the previous model. This lens is also offered as a kit lens for the Rebel T5i. It is the perfect travel lens, allowing you to get wide city & landscape shots as well as tight portrait or nature photos. This lens is also slightly smaller than the previous model, but it’s also just a touch heavier. It is definitely more capable than the previous model. It’s still not protected from the elements, but neither is the T5i. Canon has included lens coatings and ultra-low dispersion elements commonly found on more expensive lenses. These increase the clarity while reducing the amount of flaring and fringing. It’s not an L-series lens, but the quality is just about there. This lens is extremely sharp for such an affordable kit lens with this kind of focal range. You usually lose a lot of sharpness when gaining a focal range like this, but this lens manages to hang on very well. The increase in zoom to 135mm makes it a great all-around lens to leave on your camera all the time if you don’t mind the added size and weight over the 18-55mm kit lens. Like the 18-55mm kit lens, this one also has a very fast, precise, and silent STM autofocus motor. The focus does wander when you zoom though, and this lens also lacks the contrast of the 18-55mm lens. 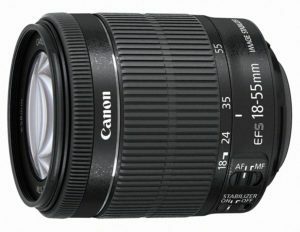 Canon’s STM focus motor in this lens is also very silent and will be hidden from your audio track when recording video. The image stabilization system also works well when recording video. You can also override the autofocus just by turning the focus ring – no need to switch to Manual Focus. This lens features a zoom lock ring to keep the barrel from creeping when the lens is held vertically. This fix is something that should be on all zoom lenses, and some don’t have it. Thankfully, Canon included it in a lens of this price. There is some noticeable chromatic aberrations but it’s nothing that post-processing software can’t handle. Because of the STM technology, the manual focus ring is electronic. The manner in which you move the focus ring isn’t connected to the gears – you’re only inputting a command to the computer and the motor does the rest. This lack of feedback can be frustrating for some, but can be overcome. This is a perfect travel lens, and with that said, you’ll probably want a lens hood to both protect this lens as you leave it on the camera all day, and to increase contrast. Canon does not include a hood with this lens; it must be purchased separately. The latest EF-S 55-250mm zoom lens adds Canon’s new STM focus motor technology for surprisingly fast & accurate autofocus, while keeping the noise down so that it won’t show up in your videos. Manual focus override is available while you’re in autofocus modes. The latest image stabilization technology is included, a must-have on a lens with this kind of zoom. This lens is perfect for sports. It’s not a very fast lens, so bright conditions really help, but it has the reach needed to get close to athletes without spending too much money. This is an option as a kit lens with the T5i beginner DSLR. If you decide to go this route, just keep in mind that the minimum equivalent focal length is 88mm. This won’t let you get any kind of wide-angle shots, and is more than twice that of what the human eye sees. This lens has an excellent zoom range but doesn’t work well as an everyday lens because of the equivalent starting focal length of 88mm. It is a good lens for specific uses like outdoor sports and nature photography, though. The image stabilization works very well. Also, the autofocus is extremely fast. The focus does reset itself after waking up from sleep mode, and this can catch some photographers off-guard. The zoom ring is nice and big, you can’t miss it. One other quirk of the STM focus that bothers some photographers is the lack of feedback when using manual focus. The focus ring only acts to tell the motor what to do, it doesn’t actually move the glass directly. The image stabilization provides up to 3.5 stops of stabilization, which is great considering this lens isn’t very fast and there’s a long zoom on it. The focus system is very good; it’s quick, accurate, and silent. The focus holds while you zoom the lens, and you can override autofocus with the manual focus ring. You can also focus as close as 2.8’. The lens maintains image quality throughout the zoom range, something that is tough to achieve in lenses with this kind of zoom range. Canon has included their lens coatings & ultra-low dispersion glass element to improve quality. Like much of Canon’s more affordable lenses, this one doesn’t include a lens hood. You’ll have to purchase that separately. I don’t know why this vital lens accessory isn’t included. The lens mount is made of plastic, again another cost-saving feature. While they’re not prone to failure, a lens this long and heavy would be better off with a more robust metal mount. The length of the barrel does drastically increase when the lens is zoomed. Hopefully the next model has an internal zoom to keep the length consistent. This 40mm pancake lens is somewhat of an odd focal length for a prime lens, but it fills in nicely where 35mm is too wide and 50mm is too tight. The super-slim profile will make it almost invincible on your camera. The f/2.8 aperture isn’t fast for a prime, but it’s a good tradeoff to get a lens so small. You should also know that this lens was designed for full-frame cameras, but it will also work on the crop-sensor T5i, where it has an equivalent focal length of 64mm. The STM focus motor in this camera is one of the fastest and most accurate produced by Canon, but it’s not completely silent like the others. This could mean bad news for photographers who also shoot a lot of video. The STM focus motor in this lens isn’t as quiet or fast as in other lenses, but it’s still very accurate. You’ll want an external DSLR microphone for video though. This lens is the perfect size and weight, and a great value for the price. The f/2.8 aperture produces a very nice bokeh when using selective focus. The focus ring does leave a little more to be desired, but there’s not much room for one on a pancake lens like this. Some users have noted that the contrast with this lens isn’t as sharp as other lenses of comparable prices. It’s still a great low-profile lens to have on the low-profile T5i. The seven-blade diaphragm produces a very nice circular and smooth bokeh, as noted by many photographers. The maximum aperture of f/2.8 will really help out in low light photography and to isolate your subject. The STM motor is one of the fastest and most accurate that Canon has produced. Focusing distance is less than one foot. This lens is extremely thin at less than one inch. It features the same coatings that help Canon lenses avoid flaring while increasing clarity, though some users have noted the clarity in this lens isn’t as strong as others. Like many other lenses, Canon did not include a lens hood. Most photographers don’t use them with pancake lenses, but if you did want to use one, you’d find it cumbersome as the hood attaches via the filter threading where the focus motor spins it. Speaking of the focus motor, this one isn’t nearly as quiet as Canon’s other STMs. Be mindful of that when recording video. There is also no manual focus override capability. This lens isn’t particularly fast for a prime lens, and it doesn’t feature image stabilization (it’s a pancake lens), so you will probably need external stabilization in low light. This lens is perhaps the best wide-angle lens for the T5i. It’s a great replacement for the older, more expensive 10-22mm EF-S lens. That lens may have a slightly faster aperture, but it doesn’t have image stabilization, and it’s significantly more expensive. The EF-S 10-18mm features Canon’s STM focus motor for precise & quick autofocus, with an on-the-fly manual override. 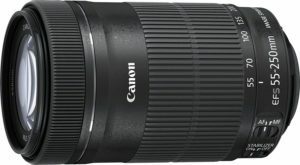 You can almost use this Canon lens for macro photography, with a focus distance of 7.5”. The all-plastic construction may put some off, but there have been no reports of any component of this lens failing. It’s already heavy enough, so you probably don’t want any metal in this lens anyways. There’s no better Canon wide-angle lens for the money available today. 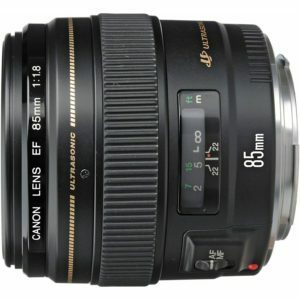 This is definitely the most popular wide-angle lens for the Rebel T5i, and for all Canon APS-C cameras for that matter. Photographers coming from L-series lenses may notice slightly more aberrations, but it’s as sharp, if not sharper, than those lenses. This camera is constructed entirely from plastic (except for the glass), so it can feel fragile to some people. It does have a relatively low profile, but it does come in at almost two pounds. This lens is a favorite of landscape photographers, architecture photographers, and real estate photographers. There is some mild distortion at the wide end but otherwise there is no noticeable distortion. The STM autofocus motor is incredibly fast and accurate. You can override it with the manual focus ring. This lens can also focus on objects as close as 7.5”; you’ll need to be this close to create any bokeh which does look nice with this lens. This lens isn’t fast but it does provide up to four stops of stabilization with the image stabilization system. Ghosting & flaring are virtually non-existent, and chromatic aberrations are only slight and can be fixed with lens profiles. Canon has included their special lens elements and coatings for superb quality. There isn’t a lot to improve on with this lens, given the affordable price in comparison to more expensive L-series lenses. For as small as this lens is, it’s quite heavy at almost two pounds. It’s constructed of all plastic, including the mount, so there’s not a lot of other ways to reduce weight here while maintaining the same image quality. One of the other complaints about the STM focus is the “focus by wire” system. No matter how fast or slow you move the focus ring, the lens will focus at the same speed. You may feel as if you’re ahead of or behind the focus because of this. 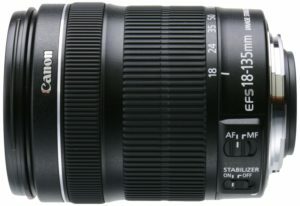 The Canon EF 85mm f/1.8 lens was designed for full-frame cameras but works just as well on the T5i, where you’ll get an equivalent focal range of 137mm. 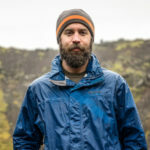 This is one of the most popular portrait lenses for Canon, especially for people who don’t make all of their money off of portraits and can’t spend five times as much on a slightly faster portrait lens. This lens will absolutely do the job for everyone else. You’ll get some incredibly round and smooth bokeh when properly focusing on your subject at wide-open apertures. The autofocus is fast and accurate, especially in bright light, and has a full-time manual focus override. This lens produces no distortion. The color rendition and clarity are superb thanks to the specialized coatings on individual lens elements. The Canon EF 85mm f/1.8 is great for street, portrait, and event photography. The fast aperture helps in low light and to isolate the subject, but the fixed focal length of 137mm doesn’t make it idea for events where you normally want zoom. This lens does have excellent color reproduction & clarity. For photographers who don’t make a lot of money with portraits, this is the best value for the price out there. You don’t need a lens much faster than this, so save your money. If you’re buying this lens for astrophotography, you may want to spend more on a faster lens. Stars do show “coma”, or an elongation. This isn’t a focal length that’s very common for astrophotography anyways – get something wider. The ring-type USM autofocus is fast and accurate. You just need to pay attention to where you’re focusing when the aperture is wide open. When done correctly, you’ll get some extremely round and smooth bokeh thanks to the eight-blade diaphragm. One of the nice things to see on prime lenses like this one is a focus distance indicator. So many lenses leave that out now, but it can be incredibly useful when focusing manually. You do have full-time manual focus control, even when in autofocus. This lens comes in a nice small package, and even though it’s made for full-frame cameras, will look and feel great on a T5i. This lens doesn’t come with a lens hood and the front element is very exposed. If you do get the lens hood, it clips on instead of rotating and doesn’t secure well. Even though the focus is fast in daylight, performance does suffer in low light. There is no image stabilization either, so you’ll still need to crank up the ISO in low light despite the fast aperture. There is also quite a bit of purple fringing in high-contrast areas, especially when the aperture is wide open. To avoid this, stop down a few stops and pay attention to edge contrast on your subject.